Described in the 2008 Saveur 100 as “At the top of our bedside reading pile since its inception in 2001,” Gastronomica: The Journal of Food and Culture was known under Darra Goldstein’s editorship for its exceptional writing on food. 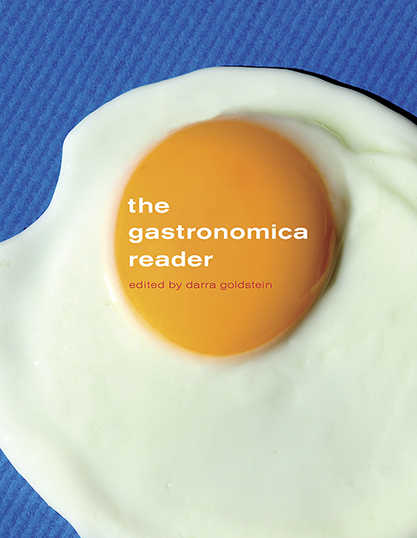 The Gastronomica Reader offers a sumptuous sampling from the journal’s pages— including essays, poetry, interviews, memoirs, and an outstanding selection of the artwork that made Gastronomica so distinctive. In words and images, it takes us around the globe, through time, and into a dazzling array of cultures, investigating topics from early hominid cooking to Third Reich caterers to the Shiite clergy under Ayatollah Khomeini who deemed Iranian caviar fit for consumption under Islamic law. Informed throughout by a keen sense of the pleasures of eating, tasting, and sharing food, The Gastronomica Reader inspires readers to think seriously, widely, and deeply about what goes onto their plates.